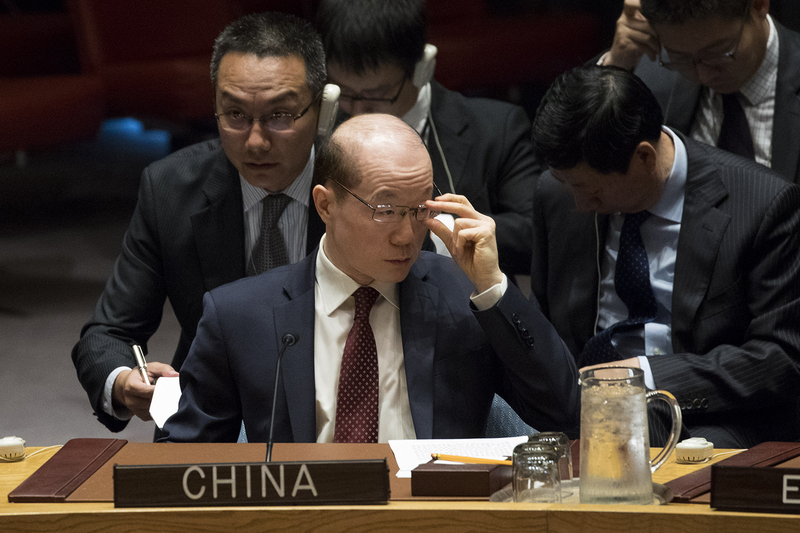 Liu Jieyi, Chinese Ambassador to the United Nations, speaks at a meeting of the United Nations Security Council concerning North Korea, at U.N. headquarters in New York City, September 11, 2017. What President Trump has said is not necessarily right or wrong. It all depends. If North Korea attacks the U.S. first, the U.S. has the right to attack the Democratic People's Republic of Korea (D.P.R.K.) in retaliation. As a sovereign country, the U.S. has no need to seek permission from the United Nations to defend itself. If North Korea attacks South Korea first, as it did in 1950, South Korea has a right to counterattack the North in retaliation. Seoul has no need to seek permission from the U.N. for self-defense. As an ally of the South, the U.S. is bound by its mutual defense treaty to defend South Korea and therefore has the right to attack North Korea. Under all such circumstances, China has no right and/or obligation to defend North Korea. Their mutual assistance treaty of 1961 makes clear that they are meant to defend each other against aggression from external actor(s), rather than encourage one of them to attack external actor(s) in the first place. Furthermore, as a member of the U.N., China shall support any U.N. effort to stop a North Korean attack, even by joining U.N. collective action against aggression by the North. If the U.S. attacks North Korea first, even with the excuse of North Korea’s nuclear weapons development, China is obliged to defend North Korea for two reasons. As a member of the U.N., China shall support any U.N. effort to stop the U.S. aggression. As an ally of North Korea, China is legally bound to do anything possible, including sending armed forces, to defend North Korea, as long as its treaty with Pyongyang remains valid. It is noted that such China-North Korea mutual obligation is legally bound, with or without North Korea’s nuclear weapons development, per the original text of the treaty. President Trump said that if the U.S. is forced to do so, it would “totally destroy” the North. He doesn’t specify what constitutes “to be forced.” His statement lacks context. One should not take his statement seriously. As a sensible businessman by training, Trump would not attack nuclear-armed North Korea first, nor attack without the North attacking the U.S. or its allies first. Even if North Korea attacks the U.S. or its allies first, it is unnecessary for him to destroy North Korea totally, even if the U.S. has such capability. Trump really doesn’t mean what he says, as always. He merely wants to raise the price tag high so as to get a good deal. Shen Dingli focuses on China’s obligation under the 1961 Mutual Aid and Cooperation Friendship Treaty to come to North Korea’s aid if attacked. There have been many rumors, confirmed privately by informed Chinese sources, that Beijing has attempted on several occasions to persuade North Korea to excise the mutual assistance clause from the Treaty, but Pyongyang has not agreed. Without the agreement of both Contracting Parties, the Treaty cannot be amended or terminated. Whether China continues to see itself as bound by the mutual defense treaty is an open question. Certainly, China is under no obligation to defend North Korea if Pyongyang initiates aggression against South Korea, Japan, the United States, or other countries. In his speech to the United Nations, President Trump said, “The United States has great strength and patience, but if forced to defend itself or its allies, we will have no choice but to totally destroy North Korea.” That suggests that the U.S. would attack North Korea in retaliation, not launch a preventive war. Therefore, under such circumstances, China is unlikely to get involved, although Beijing would almost certainly denounce any use of force. If the U.S. were to launch a preemptive strike, which means attacking first when an imminent attack is detected, the possibility of Chinese involvement increases, but in my view, only slightly. If China were convinced that Pyongyang in fact had been ready to fire a missile at Guam or one of Japan’s islands, for example, Beijing would not endorse the U.S. action, but it might not come to North Korea’s defense in any material way. Hypothetically, if the U.S. were to launch a preventive war—striking North Korea first rather than in retaliation—China would undoubtedly consider getting involved, though I believe that any decision would be based on Chinese interests, not the language of the Sino-North Korean treaty. If China opted to become involved, it would have many options short of sending armed forces to defend North Korea, including supplying equipment, intelligence, and financial support. China is likely to take an “opportunistic” attitude in case there were a war between North Korea and the United States, not because it doesn’t have principles, but because doing so, in this case, will maximize its interests. For China, the problem with a possible U.S. attack on North Korea is that it is pregnant with roomful of uncertainty. We don’t know how North Korea would react. We don’t know how many North Korean missiles may land on either metropolitan Seoul or Tokyo, or even Beijing. There is no confident estimate of how many North Korean refugees will try to cross the porous Chinese-North Korean border either, destabilizing China’s northeastern region, not to mention how many of them may also carry arms. So, China’s basic principle is that, hopefully, nothing happens. That is, the U.S. doesn’t try to change the geopolitical status quo on the Korean Peninsula with its attacks on North Korea. So, what will China do? It is difficult to predict the future. So, we look back on the past to gain insight. There was one occasion in history when both Chinese and American troops intervened in North Korea: the 1950-1953 Korean War. They ended up fiercely fighting against each other. North Korea’s invasion of South Korea was the initial trigger. China and the United States reacted, differently, in accordance to their respective best geopolitical calculus. There is no reason that things cannot repeat today. There is room for miscalculation too, then and now. Fortunately, China and the United States are on the same page, in terms of having thought through different scenarios and options. They have made a lot of different preparations for different scenarios. The “only” problem is that they haven’t discussed them with each other. So, they may react differently when something really happens. China and the United States also concur in seeing North Korean leader Kim Jong-un as a troublemaker and think the world would be better “without Kim.” Therefore, Washington and Beijing may be able to reach an agreement to remove Kim. But that’s where their common strategic vision ends. They differ in their preference for the status of “the post-Kim North Korea.” As an assurance to Beijing, Washington may promise that U.S. troops would not be stationed in North Korean territory, keeping the U.S. assets where they are now, below the 38th parallel. As an incentive, Washington may also insinuate that if China looks the other way when Washington bombs Pyongyang, Washington in return will look the other way as China installs a pro-Beijing North Korean leader when the dust clears. There may be lots of “If you do this, I will do that” propositions from Washington. China’s immediate priorities would be evacuating its citizens from affected areas, defending its border, preventing an inflow of refugees, and safeguarding North Korea’s nuclear, biological, and chemical weapons stockpiles. Locating and securing weapons of mass destruction would likely be a shared objective for China and all other governments involved, and could offer scope for cooperation, eventually under U.N. auspices. China has consistently maintained that it wants denuclearization for the entire peninsula and it would likely seek to ensure that Seoul did not end up with control of nuclear weapons. China’s domestic security apparatus also would have concerns about smuggling that could lead to proliferation. A massive inflow of refugees (estimated numbers vary from hundreds of thousands to millions) would challenge the capacity of Jilin and Liaoning provinces to provide humanitarian assistance. China would probably prefer to stop internally displaced North Koreans at the border and set up relief camps inside North Korea or as close to it as possible to avoid intermingling with the local population in those provinces, which include many ethnic Koreans. Maintaining domestic order and stability would be crucial, and failure could have political implications for the Communist Party’s legitimacy. Beyond the immediate crisis response, Beijing’s strategic stance would depend heavily on how the U.S. engaged with it, and the quality and credibility of any assurances provided. There would be the possibility of trade-offs, as Seong-Hyon Lee describes, but the lack of trust between Beijing and Washington could make reaching agreements on many elements extremely difficult. The argument that North Korea provides a strategic buffer is less common among Chinese analysts than it used to be, but conflict on the peninsula could reopen that debate. If the People’s Liberation Army (P.L.A.) assessed that there was a risk of having U.S. forces directly across the Yalu River, there could be a strong temptation to intervene. Earlier this month, Chinese international relations scholar Jia Qingguo broke precedent and wrote publicly about the need for China-U.S. talks on contingency plans. Other Chinese analysts have quietly advocated the same for some time, but until recently the government has resisted because of the political signal it would send to Pyongyang. In August, Chairman of the U.S. Joint Chiefs of Staff General Joseph Dunford visited Beijing and Liaoning province and discussed contingencies with P.L.A. counterparts including the chief of China’s Joint Staff Department, General Fang Fenghui. That was a significant step forward in military communication even in peaceful circumstances; in the event of conflict, it would be crucial to keep channels open to avoid miscalculation and a wider war. China is treaty-bound to assist North Korea in the event of an attack, but might argue that Pyongyang’s recent actions in defiance of multiple Security Council resolutions and Beijing’s own exhortations have invalidated that agreement, and it might limit its response to humanitarian assistance. As Bonnie Glaser notes, national interest would take precedence. China has demonstrated before that it does not feel entirely bound by international law when its core interests are at stake. During the Korean War, the People’s Republic of China didn’t have a seat on the U.N. Security Council. Now it holds a veto and would likely seek to use its position to manage the situation and ensure it has a strong voice in shaping the outcome. It could likely count on Russia’s support. Over the longer term, China would seek to improve its influence on the peninsula and strategic position in Northeast Asia. At the very least, it would not want to cede a strategic advantage to the United States. China would also try to demonstrate that it is a responsible major power by supporting peacekeeping, relief, and reconstruction. The most hopeful course would be for China, the U.S., South Korea, Japan, and Russia to cooperate in managing the crisis, perhaps under U.N. auspices, and through that experience build further trust that could serve as the foundation of a new, more balanced, and stable security architecture for Northeast Asia. As difficult as that would be to achieve, the sheer horror of worst-case scenarios should motivate the countries involved to do everything they can to prevent conflict, and in the unlikely event that it happens, to limit its scope, secure weapons of mass destruction, protect civilians, and restore stability as quickly as possible.